20 million dead, 40 million infected, 4 million new infections each year, and counting. As the numbers grow, so too should your hope. At the heart of the issue is access to treatment and drugs for all those infected with HIV/AIDS – the number with access is growing, however it is not growing at a rate equivalent to the spread of the epidemic. Nevertheless, hope is on the horizon and is always dawning. Now here are some stories to strengthen your hope in regards to the AIDS pandemic and Africa. At the Saint Leo clinic in small, dusty village in central Lesotho a small cluster of patients gather to be diagnosed. A thin woman sits waiting to hear advice about her racking cough. A mother of five, she said her husband had died two years earlier and had also coughed incessantly. She does not know what killed him. With these common symptoms of tuberculosis and sexually transmitted infections, many of these patients will today learn about HIV and will be tested. The test results will take a few days to be sent back from the city and many patients question why it will take so long. “We have no money and no manpower” says the clinic manager, “I have to manage everything, but neither do I feel comfortable referring patients elsewhere. They often do not show up because they are too sick, or don’t have money, or transport.” The Saint Leo clinic presents an ideal site to introduce a program to involve community members with training for HIV testing and counselling, leaving nurses time to focus on more complex aspects of treatment. Providing HIV testing and counselling at primary health clinics is key to enabling access to HIV prevention and treatment services. Lesotho has a very high rate, where 23% of adults were estimated to be infected in 2005. When Rose Dossou became pregnant she did everything she could to have a healthy baby. SHe visited an antenatal clinic at the university hospital in Abidjan, Cote d’Ivoire. She had lost 2 babies before and was tested because she wondered if HIV had killed her babies. The test came back positive. Rose wondered how she was going to handle this, at six-months pregnant and how would she tell her husband. The doctors told her the baby may also be infected. She told her husband who remained supportive and found he was HIV positive as well. Rose wanted to do everything she could to stop the transmission to her baby and began volunteering for a clinical trial of AZT in pregnant women. Even with a good trial and a smooth birth, her new-born son at 12-months was HIV positive. Rose dropped out of school and turned her HIV positive status into her life passion. Her son spent the first three years in the hospital and she became an expert on HIV. Soon both Rose and her son were recieving treatment from a french charity. Rose’s son is now 10, goes to school and rides his bike. 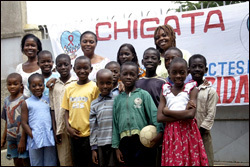 Rose is 42 and runs Chigata, an organization that supports children who need HIV treatment and AIDS orphans. Chigata, means Hope in the local language, organizes discussions, courses in theatre , distributes food kits, and provides drugs through a community-based pharmacy. In Rwanda, Mwavita acquired HIV at birth, or as a result of breastfeeding. Once diagnosed Mwavita was urgently treated for both TB (tuberculosis) and HIV. She finished her TB treatment successfully, but had to stop the HIV treatment because the medicines had to be taken with food and after one month there was nothing to eat. Thankfully a neighboring family agreed to give Mwavita food whenever her family had none so she can continue her treatment. Most dosages of antiretrovirals (ARVs) are unavailable for children, so health workers have to cut and divide tablets designed for adults in order to treat children infected with HIV. This makes pediatric care extremely difficult and puts children at a much greater risk. After a few months of restarting treatment, Mwavita is healthier than ever, she has put on weight and has returned to school. These are just a few of many stories (from WHO) that can offer great hope to the future of combatting HIV/AIDS and other disease in Africa. The HIV/AIDS pandemic highlights many issues and brings the inter-related issues of health under one lense. The lack of health workers and health infrastructure are made painfully clear, the lack of pediatric medicines and focus, and the greater problem of the lack of access to basic treatment and food almost screams at us as we examine the HIV/AIDS pandemic.